What happens in Vegas may stay in Vegas, but given the misery that was this year’s Consumer Electronics Show you’ve got to wonder how much longer the high-end-audio portion of CES is gonna remain in Vegas. The tolls that competing shows, especially Munich High End, the world economy, and (this year) cancelled or delayed flights have taken on the industry’s premier showcase were never more obvious than this past week, where attendance was so low you could practically hear the gnashing of exhibitors’ teeth. There was a time—not that long past—when you would have to wait ten or twenty minutes to catch an elevator to the exhibit floors of The Venetian hotel, then fight the crowd to make your way into jam-packed rooms. No longer, folks. 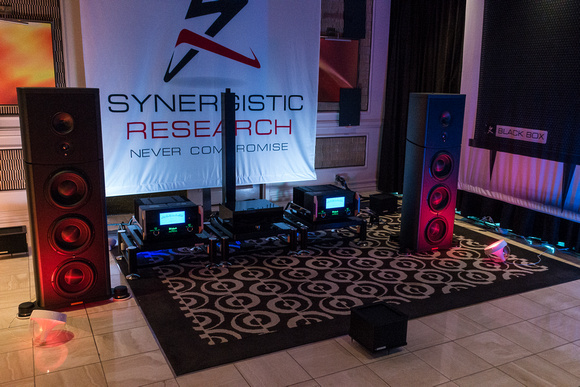 The world just isn’t coming to listen to and to buy high-end-audio gear in Sin City like it once did. And given how much the CEA charges for exhibit rooms, that spells bad news for exhibitors. And then, of course, there were the sonics. Every once in a while someone at the show would ask me what I’d heard that came close to the real thing, and I’d have to answer: “Not much.” Oh, there were more than a few beautiful-sounding rooms (which we’ll get to in a moment). But very few realistic-sounding ones. Most of the excitement was at lower price points or in sources and electronics. Anyway, here are my highlights in the category of expensive loudspeakers. As usual, my apologies in advance for any mistakes in nomenclature or pricing. I do my best to get things right and to cover the field, but (as I’ve said many times in the past) I’m just one guy with a briefcase full of blues (and classical) LPs, so if I get something wrong or miss reporting on a noteworthy exhibit—and I know that I will and have—it isn’t for want of trying. I’ve been a fan of MartinLogan’s full-range electrostats for better than three decades, but I’ve never really loved its hybrid speakers. To my ear, cones and ’stats can’t sit down at the same table without getting into an argument over who orders first—an argument which, alas, cones always win. ML’s $80k Neolith (rave-reviewed by Robert in Issue 259) appears to be an exception (though only long-term listening could say for sure). Through some very very clever crossover trickery, the sealed 12" front-firing and the ported 15" rear-firing dynamic woofers sitting beneath the Monolith’s CLX-sized curvilinear electrostatic panels manage to blend with the ’stats through the power range (where the dispersion pattern, transient speed, resolution, and distortion level of cones typically gum up the works) without turning the presentation into the usual head-of-an-angel/body-of-a-rhino monstrosity. Driven by Constellation’s top-of-the-line Reference Series electronics (Altair II preamp, Hercules II monoblocks, Orion phonostage), sourced by a Continuum Audio Obsidian turntable (making a tantalizing debut) with Continuum Audio Viper and SAT tonearms and Transfiguration and Air Tight PC-1 cartridges, and cabled by MIT, the Neolith produced the most realistic sound at the show on my Dean Martin and Penderecki albums. Despite a slight loss of resolution and immediacy (vis-à-vis the ML CLX) and a little woofer-enclosure boxiness and overall darkness in timbre (vis-à-vis the Magico M Pro/JL Gotham I listen to at home), the ML/Constellation exhibit was, IMO, as close as any system came to the absolute sound at this year’s CES. 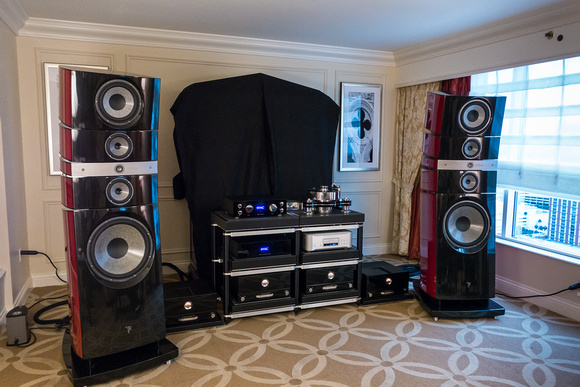 The second best sound of the show (and it was a very close second) was in the Lamm room, where Charles van Oosterum’s $225k Kharma Exquisite Midi Grand Signature three-ways (two 1" concave diamond tweeters, two 7" carbon midranges, and two 11" Omega F woofers in an WMTTMW configuration) were being driven by Vladimir Lamm’s incomparably lovely sounding ML-3 Signature single-ended-triode amplifiers, his new LL1.1 Signature four-box mono preamplifiers, and his LP1 Signature phono preamplifier with LP2.1 step-up transformer. Sourced by an ancient EMT 927 turntable (with SME 3012 ’arm and ZYX UNIverse cart) and cabled with Kubla-Sosna Elation wire, the Kharma/Lamm system produced one of the most purely beautiful sounds I’ve heard in better than twenty years of CESes—incredibly rich, luscious, and finely detailed, though quite dark in overall balance. Was it also a realistic sound? Not really. More like a dream of the real thing than the thing itself, but so breathtakingly gorgeous who cared? For musicality-first listeners this was a system to die for. Speaking of musicality-first listeners…Raidho Acoustics debuted its $65k D-3.1 three-way (sealed ribbon tweeter, 100mm diamond midrange, and three 115mm diamond woofers), using all-new drivers in a sleek, ported MDF cabinet equipped with a new flow vent and internal structure. (The new drivers are said to reduce inductance to increase transient response and raise resolution.) Driven by Aavik Acoustics’ new 150Wpc P-300 Class A power amplifier and C-300 full-function preamplifier (with built-in DAC and phonostage) and wired with Ansuz Acoustics cables, the D-3.1 system had the same gorgeous tone color, transient speed, and delicate detail that have made Raidho speakers such hits in the market. Though still a bit laid-back in the presence range and a little thick in the bottom octaves (though nowhere near as plummy as the original D-3 was), on everything from pop to classical the D-3.1 was almost as beautiful as (and markedly more powerful than) the Kharma/Lamm presentation—simply superb on voice, strings, winds, and brass with great soundstaging and phenomenally improved dynamic range (vis-à-vis the original D-3). Though the D-3.1’s midbass may still be a wee bit prominent, it appears as if Raidho has accomplished what it set out to do—improve the speed, dynamic range, linearity, and resolution of an already superior transducer. 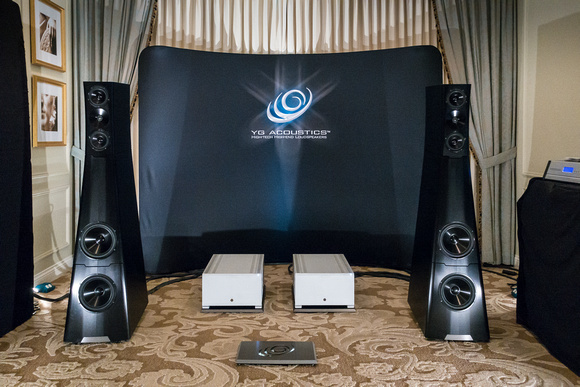 As was the case last year, I listened long and pleasurably to YG Acoustics’ $106k Sonja 1.3 three-ways (one 1" soft dome tweeter, two 6" BilletCore mid/woofers, two 10.25" BilletCore woofers in a svelte, sealed aluminum enclosure) driven, as YGs were last year, by superb electronics from Boulder Amplifiers. Even though this was a digital-only system, the sound reminded me of the SAT tonearm on the Continuum Audio Obsidian turntable in the MartinLogan/Constellation room—extremely rich in timbre, tape-like-smooth and powerful in dynamic, and high in resolution, with a touch of body and bloom and ambience that is (to put it mildly) unusual for digital. 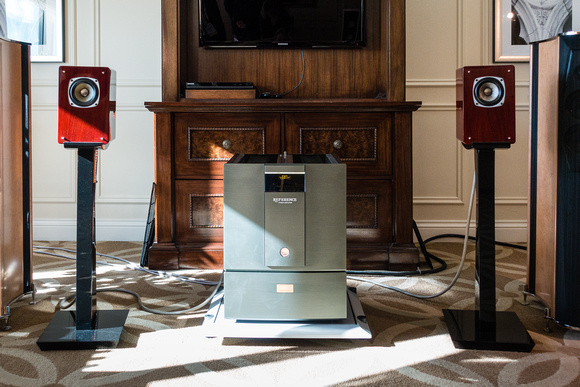 I don’t know what Boulder is doing right with its 2120 DAC, but this is the second year running where its electronics coupled with YG’s speakers have sounded extremely lovely and exciting. I am no fan of ones and zeroes, as most of you know, but that Boulder 2120 certainly sounded great. 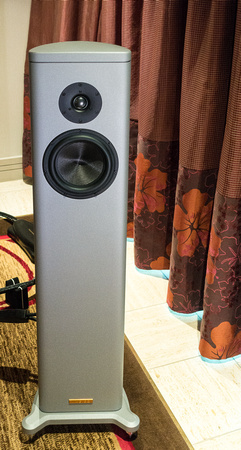 Though it is not in my price category, my fifth and final pick for best-sounding exhibit at CES 2016 is the $16.5k Magico S1 floorstanding two-way, which also made its debut at the show. Driven by Ken Stevens’ Convergent Audio Technology electronics and sourced by a Berkeley Audio DAC (the presentation was all-digital, as is generally the case with Magico), the sound was dark, detailed, and dynamic as hell, with impact and bass extension that were simply shocking in a two-way. I’ve always liked two-ways, which have some advantages (not the least of which are their smallish, easier-to-disappear enclosures and single crossovers) that multi-driver speakers don’t, and Alon Wolf of Magico has made some great ones in the past. But his new S1 takes the cake, and the candles. This is Wolf and CTO Yair Tammam’s best effort yet in a small, “affordable” loudspeaker. Ultimately, the sound with the CAT amplification was more beautiful than real (like so much else at CES), but the S1 was so very beautiful and enormously powerful and astonishingly fast and extended it disarmed criticism. Spendor debuted its $25k SP200 three-way (22mm polyamide dome tweeter, 7" polymer midrange, and two 12" bextrene woofers with outsized Kevlar dust caps in Spendor’s traditional, thin-walled, sealed enclosure). Driven by Lima electronics, the SP200 had excellent resolution, superb recovery of ambience, and outstanding staging. Although the Spendor’s Gundry dip and fullish power range made Dean Martin sound a bit more like a bass than a baritone, the SP200’s sound was still extremely lovely and easy on the ear. Indeed, in many ways this was the best Spendor I’ve heard at a trade show. Though it isn’t in my bailiwick, the $2k Air Tight Bonsai one-way mini-monitor sounded so terrific driven by Air Tight’s 180Wpc Reference ATM-2001S stereo amplifier that I can’t resist reporting on it. Where it played, the Bonsai was unusually seamless and lively, albeit excessively sibilant in the upper register of Dean Martin’s mellifluous voice. Of course, its low bass was limited, as was its top treble—such is the nature of one-ways. That said, on my Penderecki LP, the viola sounded like viola instead of a miniature cello, which is the way the Spendor made it sound. Outstanding at its price, the Bonsai was, warts and all, one of the few lifelike speakers at a show that, as already noted, was high on beauty but low on the sound of the real thing. 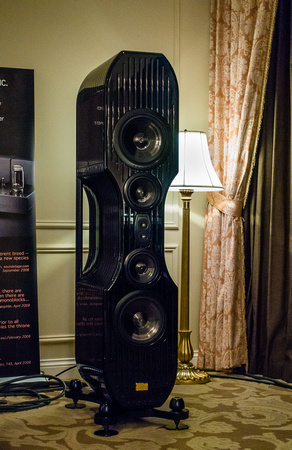 The surprise of CES for yours truly (as I’ve never been a fan of Monitor loudspeakers), the $29k Monitor Audio Platinum PL500 II three-way, seven-driver floorstander, with AMT tweeter, two 4" midranges, and four 8" woofers in an WMTMW arrangement, sounded a bit like a ceramic-coned Raidho. 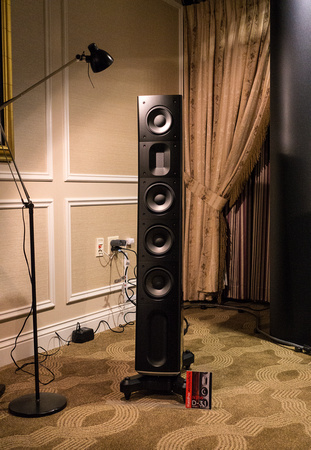 Driven by Moon by Simaudio electronics, the PL500 had great transient response, excellent resolution, dense dark tone color, and really explosive dynamics on both pop and classical cuts. A noteworthy debut—and a genuine change of course for a loudspeaker manufacturer whose products have in the past been more dry and clinical than rich and musical. As was the case with Monitor Audio’s PL500 II, I was surprised by the Verity Audio Sarastro IIS three-way WATT/Puppy-like floorstander with ribbon tweeter and 6" midrange in the top cabinet, and an 11" woofer in the ported enclosure beneath the mid/tweet. 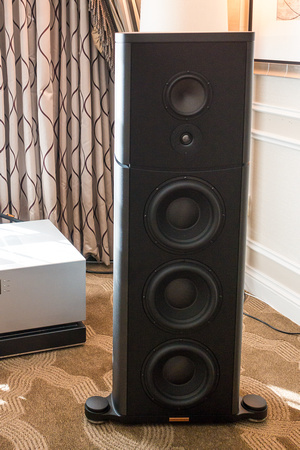 I’ve not always liked Verity loudspeakers at past shows, but this year I did. Driven by Zanden’s superb electronics (including its gorgeous, completely redesigned 60W 9600 monoblocks), the Sarastros were pretty friggin’ wonderful on every piece of music I heard, and simply outstanding on the Janaki Trio, which sounded—for once—both lovely and realistic. 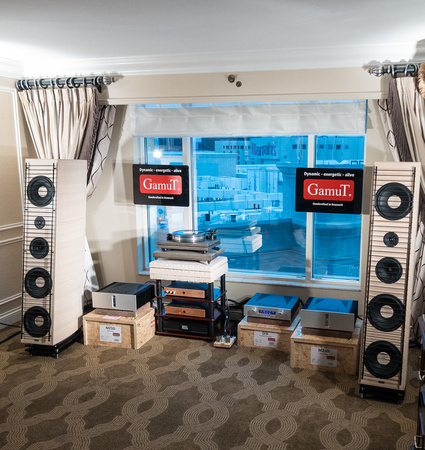 Gamut introduced its $140k Zodiac three-way floorstander with three 10" woofers in a beautiful stacked-wood cabinet ported for impulse control. Painstakingly aligned for phase accuracy, the Zodiac, driven by Gamut electronics, sounded open and neutral and incredibly fast on Brubeck’s “Take Five”— with none of the crossover/cabinet gauziness that began to bother me after hearing the one-way Bonsais. Absolutely superb on my Dean Martin and Penderecki LPs, the Zodiac came as close to sounding natural as the Bonsai did, without the Bonsai’s sibilance or frequency-range limitations. Here is a multiway that sounds a lot like a single-driver speaker, albeit with just the slightest suckout in the presence range and overall leanness of timbre. 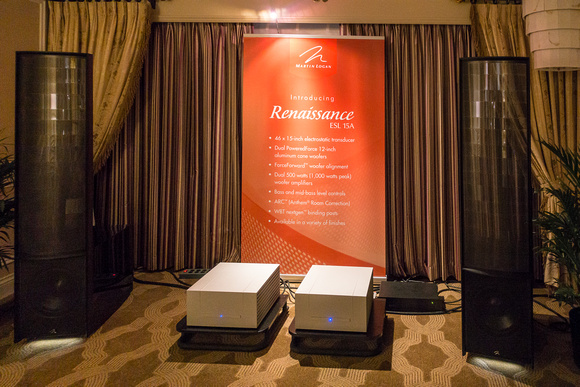 Richard Vandersteen launched his new $30k Model 5A Carbon loudspeaker, driven by his own (excellent) electronics. With technology trickled down from Vandersteen’s Model 7 II, this four-way floorstander (0.75" ceramic-dome rear-firing tweeter, 1" front-firing carbon dome tweeter, 4" carbon midrange, 7" poly/Kevlar sandwich mid/bass, and two powered 12" aluminum cone woofers) was exceptional on every piece of music I heard played back—superb transients, lifelike midrange color and texture (a Vandersteen house specialty), and an overall openness and bloominess (even, to a limited extent, on an MQA digital version of “Riders on the Storm”) that have always been Vandersteen trademarks. The sound was much more focused and higher in resolution than previous 5 Series Vandys, making this a superb debut. 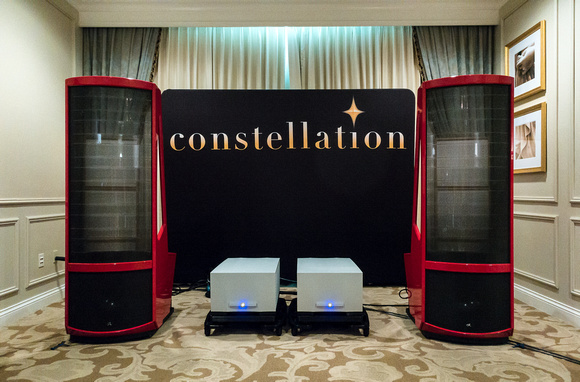 On the subject of trickle-down technology, MartinLogan introduced its $25k Renaissance ESL 15A hybrid ’stat/cone floorstander, driven like its big brother by Constellation electronics. As is the case with the Neolith, from which it descends, the 15A uses a largish (46" x 15") ESL panel coupled, in this case, to a pair of powered 12" aluminum woofers. The results were a bit mixed: quite impressively of a piece on the Liszt Mephisto Waltz, unbelievably tight and deep-reaching (in a small room) on a Bach Organ Prelude, but extremely hard, almost piercing sounding when jacked way up on Donald Fagen’s “Weather In My Head.” Chances are I’ll review this speaker, so you’ll have to wait for a final decision. But on classical music, at least, this was a superb transducer, with a good deal of the Neolith’s realism and (arguably) better-defined low end. 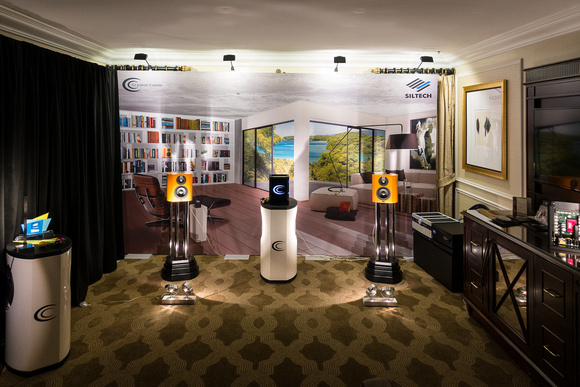 Crystal Cable’s €16k Minissimo Diamond two-way mini-monitor (now with diamond tweeter, silver voice coil, and silver wiring) coupled with its €10k Submissimo powered subwoofer made a seamless and exciting blend on most music. Driven alternately by the Crystal Cable Cube integrated amplifier and Siltech’s wonderful SAGA system electronics, and wired with Siltech’s Triple Crown cable, the combo sounded fabulous on Rossini's L’Italiana in Algeri overture—terrific dynamics and superior stage depth with more resolution and ambience retrieval than previous Minissimos, thanks to that diamond tweeter. 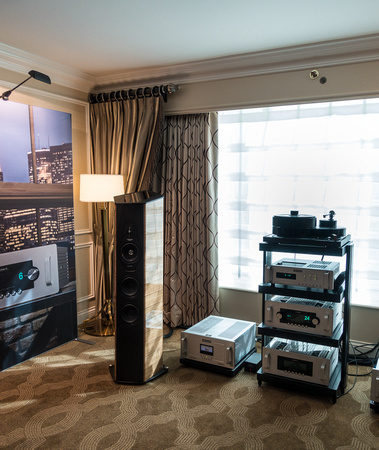 One of the liveliest sounds at the show, the Mini had no trouble keeping up with the Submissimo in dynamic range, though the overall sound was a bit bright and the sub did go a bit out of control on one cut, exciting room modes. My Best Sound winner at the Tokyo Show, the Vivid B1 Decade two-way stand-mount, made its American debut at CES, driven by Luxman electronics. I didn’t really get to hear the speaker on my own LPs. Instead I witnessed a fascinating experiment. 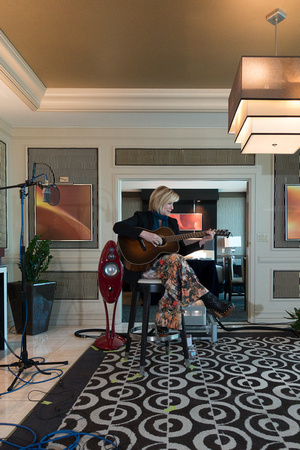 After performing three songs for the audience in the On A Higher Note room, songstress Lori Lieberman sang “The Last Thing on My Mind,” twice—first for the folks in attendance and then for her spouse’s, recording engineer Joe Calli’s, microphones. After recording Liebermann in 192/24 via an Apogee AD/DA, Calli then played back what he’d recorded through the Vivids. To my ear, Lieberman’s voice was altogether louder, darker, and far more “closed-in” (e.g., without air or ambience) in digital playback, losing all of the delicate texture, unconstrained openness, and three-dimensional bloominess we heard when she was singing live. The guitar was also louder and darker and fiercer. Of course, Lieberman was singing into a microphone with a windscreen—which is a little like singing into a wall. But when, after finishing the digital playback, Calli switched to an analog recording of the same song made by Bob Clearmountain, the sense of ambient air, delicacy, and much of the bloom we heard in Lieberman’s live performance returned. Timbre was a lot closer to lifelike, though still a bit dark, while the sense of strain (of singing into a wall) that robbed her voice of all of its delicate dynamic and harmonic texture in the digital recording was reduced (though not eliminated). The experiment simply confirmed what I’ve always thought about digital—since I first visited a Telarc recording session of the CSO in Symphony Hall twenty-some years ago. Though neither recording was truly lifelike, the vinyl—with its more natural ease, bloom, air, and timbre—came so much closer to the real thing it was no contest. Sorry, you digital-philes, but that’s the way it was. 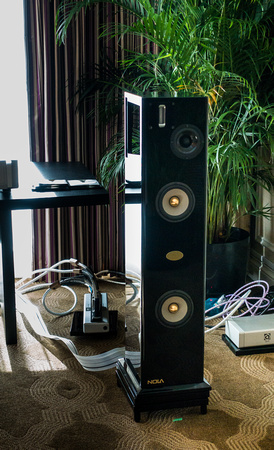 Vienna Acoustics played its top-of-the-line $33k Klimt “The Music” 3.5-way floorstander driven by Chord electronics. 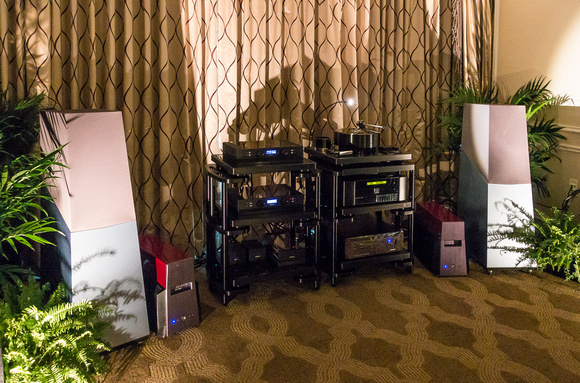 The combo produced a dark, rich, lovely sound, with good midrange presence and top-end brilliance. A little vague in imaging, a little exaggerated in the bass, and not the last word in transient speed, “The Music” was nonetheless enjoyable to listen to. 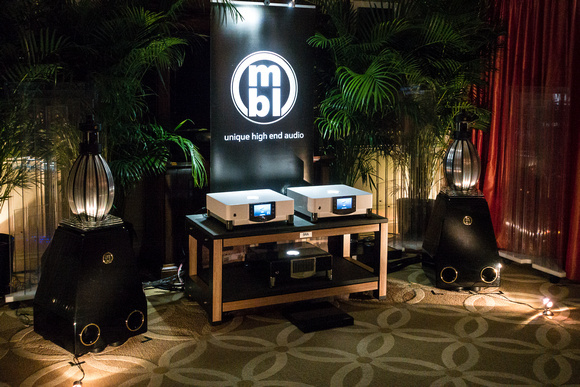 MBL had its usual excellent show with the $70.5k 101 E MkII driven and sourced by the company’s Noble line of electronics. Absolutely terrific on voice and transients, with nonpareil 3-D soundstaging and better center focus than I remembered, the MBLs scored high everywhere but the bottom octaves, which sounded a bit limited in extension and slam (though very well defined). 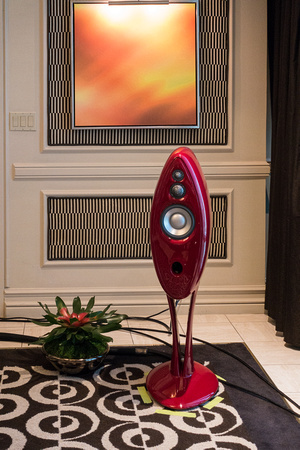 Sonus faber showed its rhomboidal $45k Il Cremonese 3.5-way floorstander with ARC electronics. This was a big rich sound, not at all like ARC from the old days. Dean-o sounded very similar to the way he sounded on the Spendor SP200, but not quite as “there.” The presentation wasn’t really lifelike, but it was gorgeous. 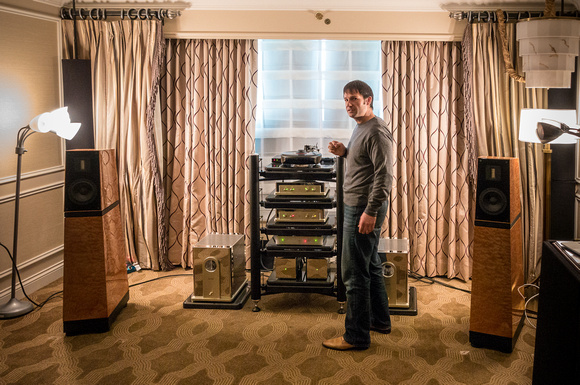 The $58k Magico S7 was being shown with top-line Soulution electronics (701 monoblock/755 phonostage/725 preamp) on Joe Lavrencik’s fabulous CMS Maxxum rack with a Transrotor Orion turntable/SME tonearm/Air Tight Opus cartridge as the source and Vovox cabling. Though Dean-o sounded decent, he also sounded a little flat and dimensionless in this smallish room and Mark Knopfler’s guitar on Brothers in Arms was way too bright. I have the feeling that the cartridge and cables were not broken in because the system was not serving up the transparency, resolution, and realism Magico and Soulution are capable of. Focal’s massive Grand Utopia EM, shown with VAC electronics, offered up incredible three dimensionality and focus with a tonal balance that was a bit dark but still natural. 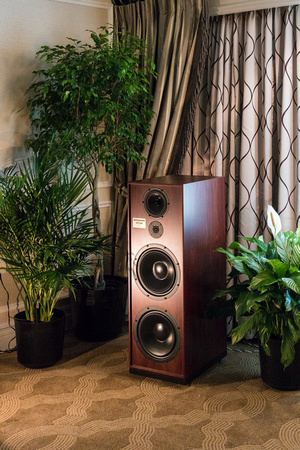 However, after listening to the crossover-less Bonsai, I thought the crossovers in the Grand Utopia (and many other multiway speakers at CES) were adding a slight veil to the sound, like the stockings they put in front of lenses to flatter older actors and actresses. That said, the EM was much better on Dire Straits than the Magico S7 because of its smoother tweeter, deeper bass, and fuller power range. 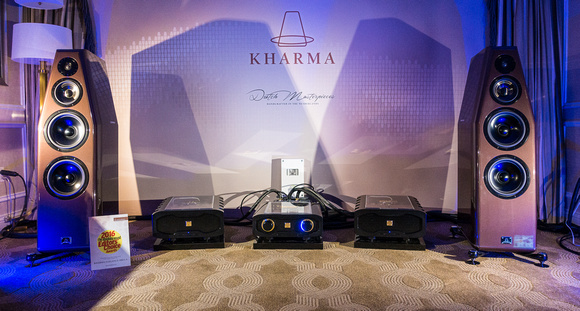 The $54k Kharma dB11-S three-way driven by Kharma electronics was quite good on Dean-o, with less of that multiway crossover haze, for some reason. 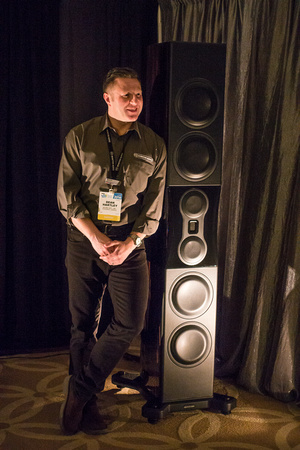 The sound was not quite real but closer to lifelike than many other rooms—quite dimensional, a bit dark in overall balance (bespeaking a little suckout in the brilliance range) with superb bass. The dB11-S came close to a Best of Show sound. 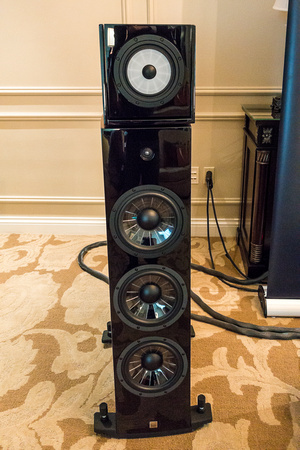 Acapella Audio Arts showed its $55k High Cellini floorstander with ion tweeter, spherical-horn-loaded midrange, and internal woofers driven by Acapella’s La Musica M electronics. This was not a rich sound but a very coherent and lively one. 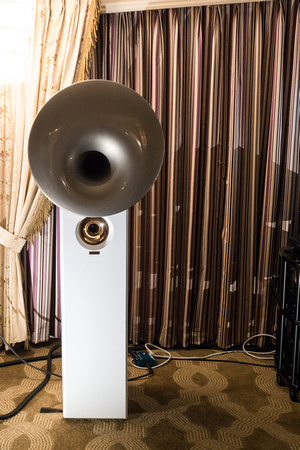 Carl Marchisotto of Nola showed his $33k Metro Grand Reference Gold open-backed ribbon/cone multiway, driven by VAC electronics (including the 200iQ amplifier). As usual with Nola, the sound was lovely, sweet, and spacious—absolutely terrific on Patricia Barber’s vocals from Cafe Blue. 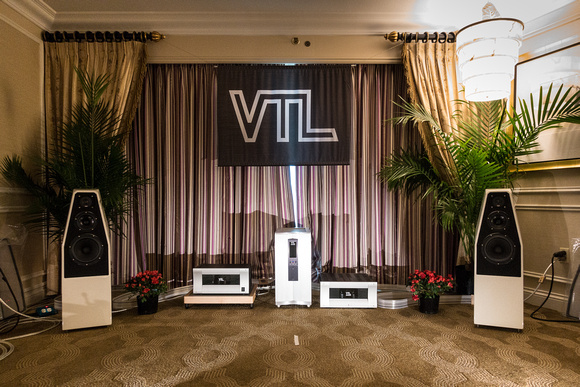 The $15.9k Wilson Sabrina with VTL electronics was, simply put, the best Wilson loudspeaker I’ve ever heard at a trade show—and would’ve been a Best of Show contender were it in my price category. Finally, Synergistic Research demonstrated its UEF (uniform energy field) room treatment and graphene SR Atmasphere Level 4 cables, Atmasphere Level 3 power cords, and tweaks. Though the UEF panels seemed to darken timbre and somewhat reduce immediacy, they also unquestionably added depth and width to the soundstage, dimensionality to the imaging, and density of tone color top to bottom (particularly in the bass). The effect was head-scratching but unquestionably real, as Ted Denney did a with/without-UEF comparison to prove the point.